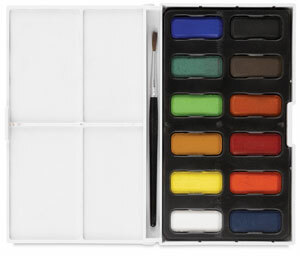 Pocket Set of 12 Pans — Twelve half-pan watercolors in a convenient, pocket-sized, white plastic box. The box has a hinged lid that doubles as a palette. 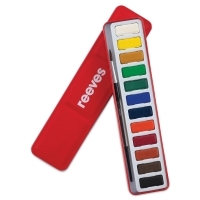 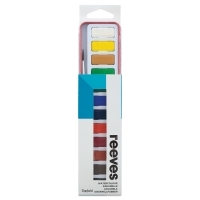 Colors include White, Light Yellow, Yellow, Green, Light Green, Blue, Violet, Orange, Red, Burnt Sienna, Black, Burnt Umber.